At The Color Run, we’re all about spreading the LOVE. We feel that it’s important to highlight meaningful causes, connect with the community, and to GIVE BACK! If you have questions about how charities work with The Color Run, check out our Charity FAQ here. In 2019, The Color Run Australia is continuing to join forces with the Starlight Children’s Foundation as our Official Charity Partner, who are committed to bringing fun, joy and laughter to sick kids and their families. The Color Run encourages participants to raise funds and awareness for the incredible foundation with the help of volunteers and activations on site. The Color Run is a for-profit event management company dedicated to producing high-quality events for all of its participants. As a for-profit event management company, The Color Run frequently partners with different charities to help shine a light on their amazing work within the community and the causes they stand for. The Color Run has raised donations for more than 100 local and national charities since 2012. To date, The Color Run has donated more than $6 million to charity since its founding in 2012. DOES THE COLOR RUN HELP A CHARITY CAUSE? Yes. The Color Run works with hundreds of local organizations. The Color Run’s number one goal in working with charities is to increase cause awareness. We want to help shine a light on important issues. 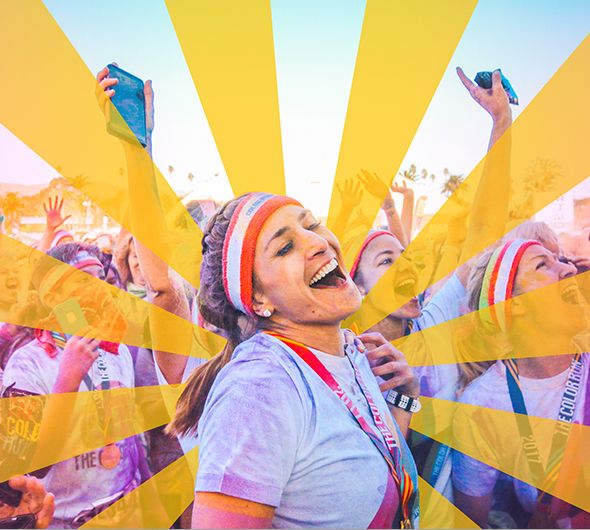 We hope our Color Runners will spend time learning about our partner charities, join their mailing lists, attend charity events and become advocates for these causes. We give our charity partners a microphone to speak to thousands of good-hearted people. DOES THE COLOR RUN DONATE MONEY TO CHARITY? To date, The Color Run has donated more than $6 million to charity since its founding in 2012. Post Race Donation. This is where we make a financial donation to our charity partner. This set amount is determined in communication with the charity and depends on the level of involvement/volunteers provided by the charity. Embedded Giving. We provide our runners the opportunity to add a donation that goes directly to the charity during the registration process. Our charities are constantly overwhelmed by the kindness of our Color Runners. Charity Registrations. In some cities, we provide the partner charity a limited number of charity registrations. The charity sells these registrations through their own website and keeps 100% of the listed price of the registration. IS MY REGISTRATION FEE TAX-DEDUCTIBLE? No. Your registration fee is not tax-deductible. The only tax-deductible portion would be if you made an additional donation directly to the charity during the registration process or bought the registration directly through the charity. “On behalf of the Board of Trustees, the youth you are helping and all who are concerned with the Boys & Girls Club of Atlantic City, I want to express our most sincere appreciation for inviting us to participate in The Happiest 5K on the Planet! “The complete process, from marketing the event to assisting in the Color Zone, was such a memorable experience for our staff and children. This event truly stands out from other 5Ks because of your unique happy powder, your generous give-back component and the consistent support we received from your organization. You and your staff are professional, kind, knowledgeable and enthusiastic, which is the perfect recipe for a successful event! Our children are still talking about their experience and we hope to partner with you again in the future. Sign up to ensure exclusive access to Presale Tickets and Special Offers.